The oak treehopper is fairly common on deciduous and evergreen oaks, Quercus spp., where it is sometimes sufficiently abundant to cause concern to owners of valuable shade trees. In Florida, we have reports of professional pest control companies being hired to control this pest. However, damage by a colony of this species of treehopper is minor and essentially confined to small oviposition scars in twigs. This contrasts with the closely related thorn bug, Umbonia crassicornis (A. & S.), which can, when abundant, cause considerable dieback or even death of small trees. Figure 1. Adult and nymphs of the oak treehopper, Platycotis vittata (Fabricius). Photograph by Lyle J. Buss, University of Florida. Funkhouser (1951) gives the distribution as Brazil, Mexico and the United States. This species also has been reported from Vancouver Island, Canada. The recorded distribution in the United States is primarily in the states that form a broad U-shaped curve from Pennsylvania and New Jersey south through the Carolinas and Georgia to Florida, then west to Mississippi, Texas, Arizona, California, and north to Oregon (and Vancouver) where the coastal climate is moderate. Interior records include Ohio, Illinois, Tennessee, and western North Carolina, but, in general, there is a scarcity of records from the great heartland areas of the United States. The 40th parallel serves as an approximate northern range limit with few exceptions. 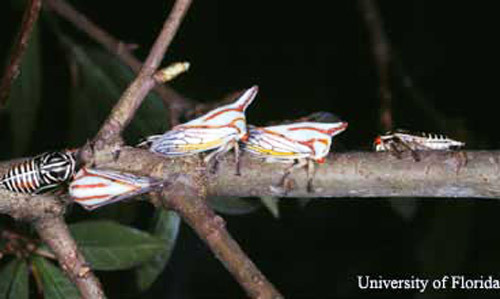 Oak treehoppers are large, heavy-bodied, triangularly-shaped insects often marked with stripes and usually, but not always, bearing a frontal horn. The length is 8 to 9 mm not counting the horn; with the horn the length varies from 10 to 13 mm. This species is highly variable in color and in the size of the horn. Four of the variations have achieved formal nomenclatural status, but three have been relegated to mere varieties or forms by Dozier (1920) and Cook (1955). 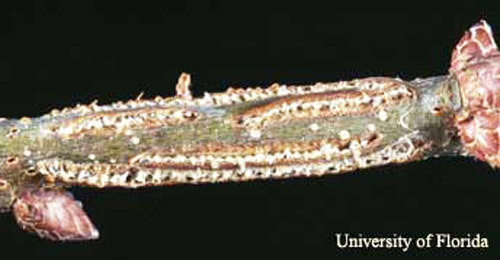 Dozier observed a caged colony on oak at Gainesville, Florida, change from the striped form to the mottled appearance in two weeks time. Cook found the male genitalia of all four varieties are similar. He concluded, "...though intergrades among the forms exist in many localities, all four can frequently be recognized as distinct forms and therefore the names serve a useful purpose; that of designating a certain morphological type." Figure 2. Adult (striped form) and nymphs of the oak treehopper, Platycotis vittata (Fabricius). Photograph by Lyle J. Buss, University of Florida. Figure 3. Adult (mottled form) female and nymphs of the oak treehopper, Platycotis vittata (Fabricius). Photograph by Lyle J. Buss, University of Florida. Dozier (1920) reported that the life history of this species had never been worked out, but that his observations tended to show it is a single-brooded species. Florida records are puzzling, but there is no doubt that the main hatch is in the spring with peak numbers usually occurring from the second half of March through early May. FDACS-DPI has several records showing occurrence in November, December and January, but none in February nor any from August through October. In the northern part of its range it seems likely that hatching is delayed until late spring since most of the northerly records known to the author are from June to early October. There are five nymphal instars. Behavior-wise, individuals of this species are gregarious. 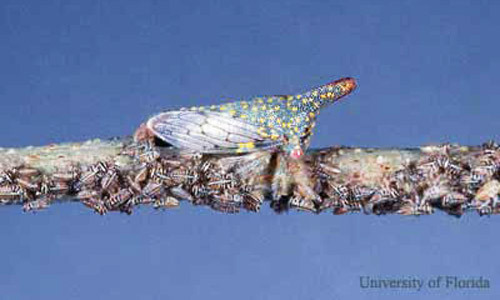 Dozier (1920) found large colonies of from 50 to 100 treehoppers clustered together on oak branches. Beamer (1930) even observed maternal instinct in females of Platycotis vittata on oak in California. Females were observed to "stand sentinel" between their respective colonies of nymphs and the body of the tree. A female would allow herself to be picked up rather than fly away from her perch. Beamer watched one female repel a small vespid wasp approximately a dozen times from her colony of nymphs. After the vespid apparently grew discouraged and flew away, "...the membracid flew to her young, crawled over the spot where the vespid had alighted, apparently examined to see that they were uninjured; then making sure all was well again flew to the twig just below the nest, turned her head toward her young and stood immobile." Figure 4. Eggs of the oak treehopper, Platycotis vittata (Fabricius). Photograph by Lyle J. Buss, University of Florida. In Florida, DPI files show adults and nymphs reported several times on each of the following oaks: laurel oak, Quercus laurifolia; water oak, Quercus nigra; turkey oak, Quercus laevis. Other plant species recorded as "hosts" show only adult treehopper present. These specimens most likely were strays temporarily resting on plants near infested oak trees. 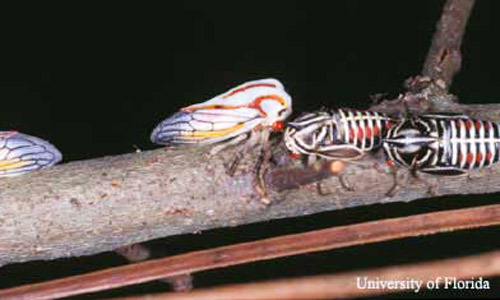 DPI has over a dozen records of the oak treehopper being caught in Steiner traps hanging in various kinds of citrus trees, primarily calamondin, Citrus mitis. Other hosts include live oak, Quercus virginiana, in Florida and cut-leaved birch, Betula alba variety in Ohio as reported by Dozier (1920). McAtee (1921) listed red oak, Quercus rubra, at Plummers Island, MD, near Washington, DC as a host and Osborn (1940) reported examples taken from river birch, Betula nigra, in Ohio. DPI has adult specimens collected in Raleigh, NC, May 10, 1952, on white oak, Quercus alba and blackjack oak, Quercus marilandica, by B.K. Dozier. At Raleigh, Dozier also collected nymphs and adults on Quercus rubra, October 18, 1951. Essig (1958) reported that he collected a freshly hatched colony from a cultivated chestnut tree (presumably in California). Only one other species of Platycotis is recognized north of Mexico, a California species with distinct male genitalia as illustrated by Cook (1955). In Florida, Platycotis vittata is sometimes mistaken for the thorn bug, Umbonia crassicornis, but the latter has a differently shaped horn which is much more upright. And the posterior process or extension of the pronotum is longer, usually reaching to the tip of the tegminae of the thorn bug. In Platycotis vittata the tegminae extend for 1/4 to 1/3 their length beyond the posterior process. Nymphs of these two species are similar but the thorn bug has two parallel black stripes along the tegminal wing pads, whereas in Platycotis vittata the pad is a fairly uniform dark color with a pale border. 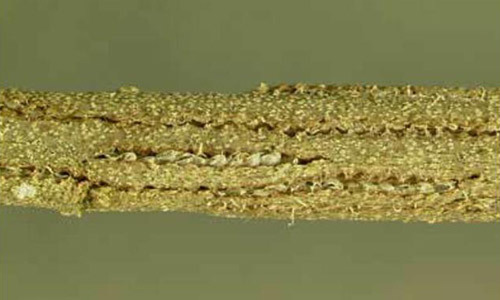 There is considerable difference in the pattern of dark bands on the head and pronotum and usually a distinctively different angle of the horn. Some mature nymphs of Platycotis vittata do not have a horn, and it is surmised that these give rise to hornless adults. These hornless adults can be separated from superficially similar other U.S. species by using the subfamily character of hind tarsi much shorter than the front and middle tarsi. For example, Thelia bimaculata (F.) has a horn shaped similarly to Platycotis vittata and the females are a drab color similar to the horned, mottled variety of vittata. Superficially, the resemblance is close, but Thelia has hind tarsi as long as the front and middle tarsi, while Platycotis has the greatly reduced hind tarsi. In addition, Thelia has a longer posterior process. Figure 5. Oviposition marks of the oak treehopper, Platycotis vittata (Fabricius). Photograph by Lyle J. Buss, University of Florida. Ordinarily, this species does not do enough damage to justify control measures. Appreciation is extended to Dr. Dale H. Habeck, Professor (retired), Department of Entomology and Nematology, University of Florida, Gainesville, who provided records of Platycotis vittata from the files of the main experiment station at Gainesville. UF/IFAS extension entomologist James E. Brogdon was consulted for management recommendations. Beamer RH. 1930. Maternal instinct in a membracid (Platycotis vittata) (Homop.). Entomological News 41: 330-331. Cook Jr. PP. 1955. Notes on nomenclature and variation in Platycotis (Homoptera: Membracidae). Pan-Pacific Entomologist 31: 151-154. Dozier HL. 1920. Notes on the genus Platycotis Stal. Ohio Journal Science 20: 209-212. Essig EO. 1958. Insects and Mites of Western North America. MacMillan Co., 1050 p.
Funkhouser WD. 1951. Genera Insectorum, Homoptera: Membracidae. Fasc. 208: 1-383. McAtee WL. 1921. Membracidae of the vicinity of Washington, DC. Proceedings of the Biological Society of Washington 34: 123-134. Mead FW. 1962. The thorn bug, Umbonia crassicornis (Amyot and Serville) (Homoptera: Membracidae). Florida Department of Agriculture and Consumer Services, Division of Plant Industry, Entomology Circular 8. Osborn H. 1940. The Membracidae of Ohio. Ohio Biological Survey Bulletin 37: 51-101. Author: F.W. Mead (retired), Florida Department of Agriculture and Consumer Services - Division of Plant Industry. Originally published as DPI Entomology Circular 57. Publication Date: June 2004. Latest Revision: December 2014. Reviewed: December 2017.